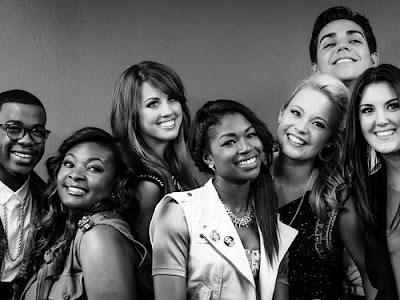 American Idol Season 12 is definitely a season for women! Girl power is alive with all 5 girls from the original top 10 still standing tall and only 1 male contestant remains. Also, two female contestants; Kree Harrison and Angie Miller are among the top 3 for the week. This week, we say goodbye to Burnell Taylor with no chance of redemption as the judges save was not used for him. During his song for the judges, his closest co-AI contender Candice is emotional while one of the judges, Mariah Carey is holding back her tears. Taylor was sent home despite the fact that Lazaro Arbos was forecasted by Jimmy Iovine to be the contender who will most likely go home for the past two results night now. Although Lazaro was in the bottom 3 last week, he was among the top 3 this week. Joining Burnell for this week’s bottom 3 includes Janelle Arthur and Amber Holcomb. Amber actually rocks with this week’s rock performances through her rendition of Heart’s What About Love. The same applies to her version of Lately by Stevie Wonder last week. Unfortunately, despite consistently improving and rocking the Idol stage for the past few weeks, she fails to charm her way into the audience votes. Even Janelle Arthur and her country vibe fail to bring in the votes despite countless other country singers winning the previous seasons or gracing the final 2. Two of them even returned to perform their own songs on back on AI during results night; Carrie Underwood and Casey James. Orianthi also performed with her famed guitar skills during the performance night. There is still one hope for country fans through Kree Harrison though. With a few more weeks to go, it’s definitely girl power rocking American Idol Season 12!